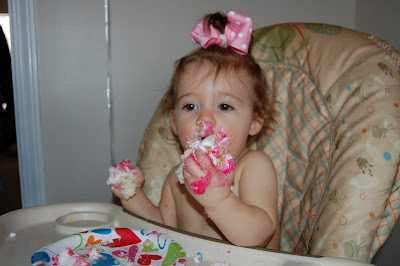 Today M.C's best buddy, Cadie Belle turns 1 year old. 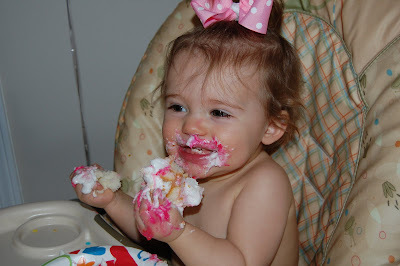 HAPPY BIRTHDAY CADIE!!! We love you. 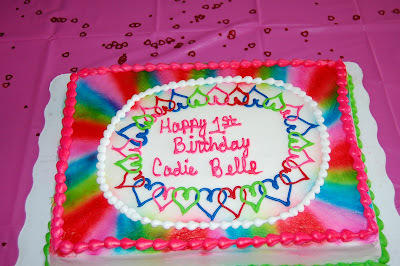 We celebrated Cadie's birthday this past Saturday. I made the mistake of telling M.C. a few days before the actual party. 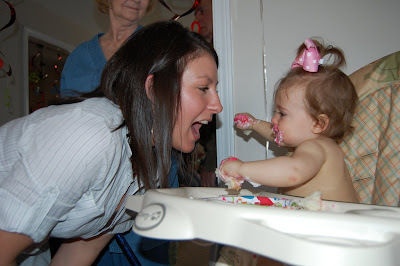 She asked me everyday is today Cadie's party; do we get cake today momma! 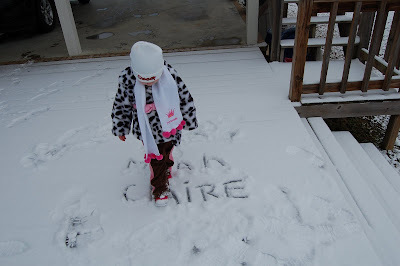 Cadie got some fun toys and a bunch of super cute clothes! 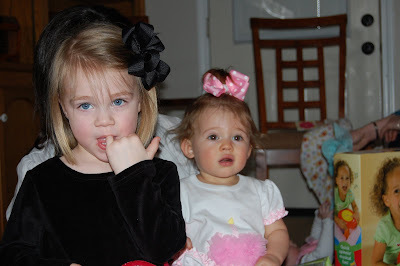 MC and CB; I can't believe how much they have grown in the last year! Then 2 bites later she was threw. 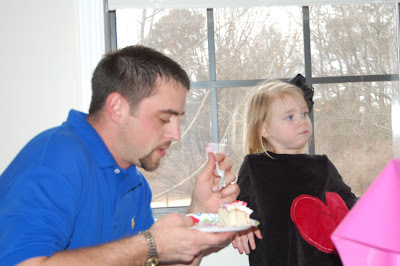 At least Daddy got to eat the rest of her cake! 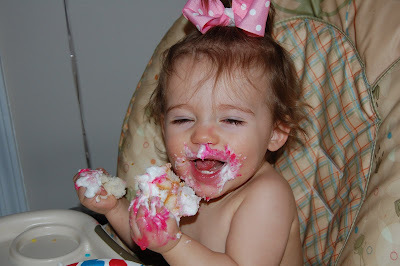 YUMMMMMMMMMY Cake! Now that's one happy girl! 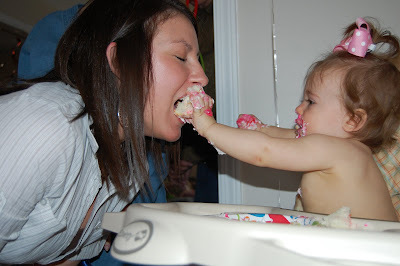 Poor Mommy Givens got more than a mouth full of cake; she got a face and hair full of icing by the time it was over! 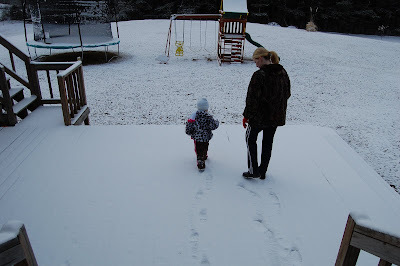 We Finally Got Some Snow!!!! For weeks NWA & Central Arkansas have been getting pounded by ice and snow but we haven't gotten any of that here in SW Arkansas. But that all changed yesterday afternoon. 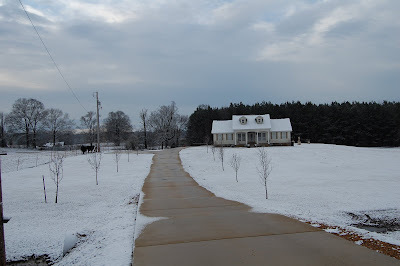 It started snowing early afternoon and didn't stop till late last night. 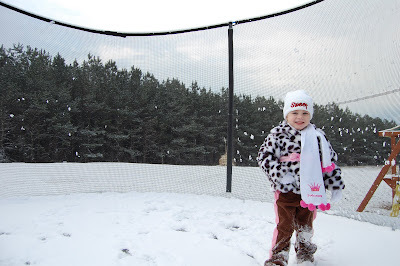 Micah Claire was so excited, she couldn't wait to get out there and play this morning. 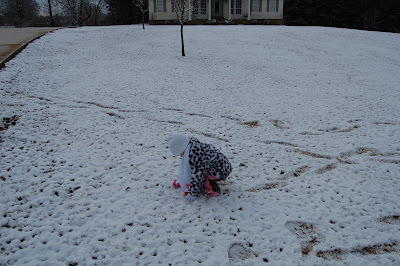 Her very first steps on snow! 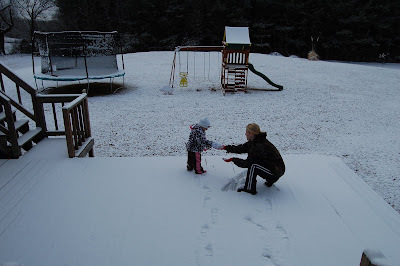 Her first time to ever touch snow! The gleam in her eye was enough to make this momma cry! 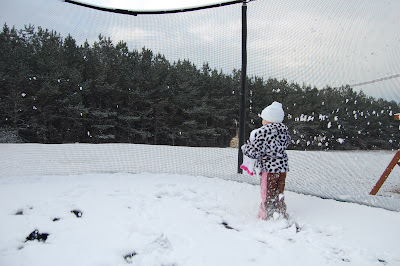 Her first stop was the trampoline of course. 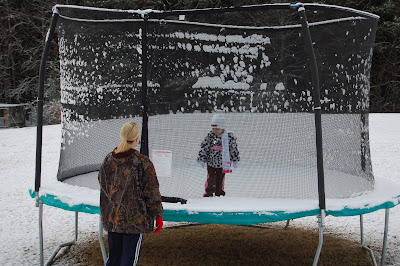 She was in snow, trampoline heaven..... if there is such a thing. M.C. trying to get mommy on the trampoline.... and of course I couldn't resist. 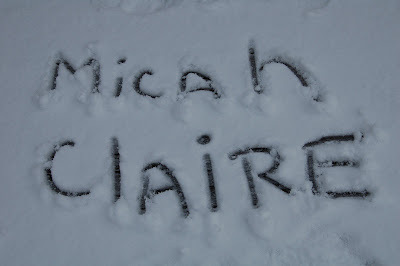 I remember how much fun my little brother and me use to have doing this oh so many years ago! 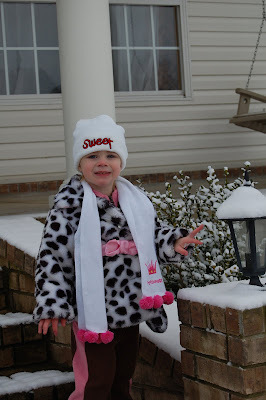 I couldn't get this kid to keep her gloves on. 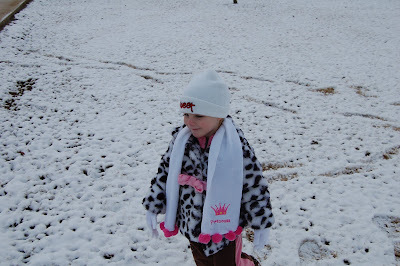 She wanted to touch the snow with her bare hands. 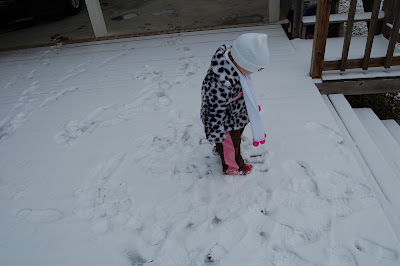 She loved walking through the snow and getting to see her foot prints ( or my feet marks as she says) She wanted to build a snowman soooo bad, but we just didn't get enough to do that; maybe next time! 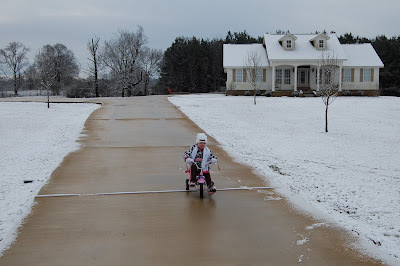 You would think with all the snow she wouldn't have cared to be on her silly bike.... but no,not this child! And through it some more.... Till it was gone. I love where we live. We were so bless to have found this land. We have 5.3 acres and are surrounded by many more beautiful rolling acres. 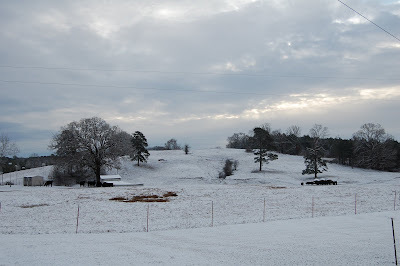 This is the hill right off our drive way. 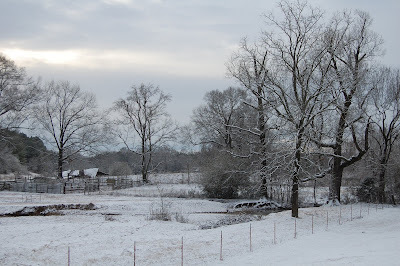 And this is the old barn with a creek in front of it right out our back door. But this is my favorite. There are 2 times when I really love this view; 1) When the pear trees are blooming white in Spring and 2) when it's covered snow! 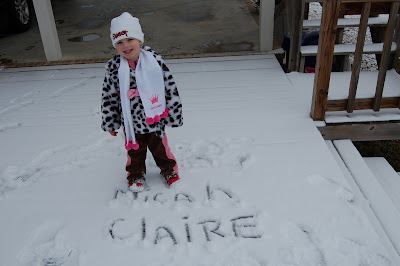 Last Thursday Micah Claire turned 29 months old! It's kinda neat because this is my last month to be 29 too! Next month I'll turn 30 and she'll be a whopping 2 1/2 years old. 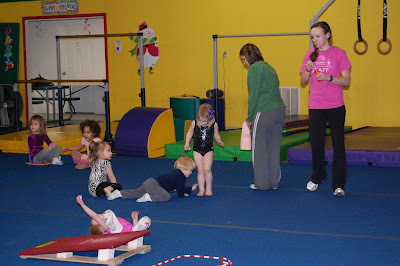 Micah Claire and I have been doing Mommy-and-Me gymnastics since September. She absolutely LOVES it! 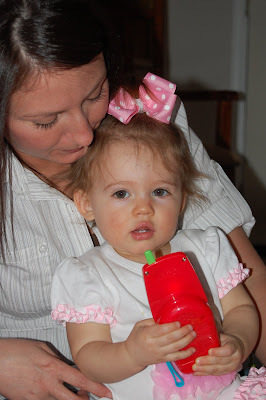 Several times during the week, when she wakes up, she'll say Momma is it Thursday? 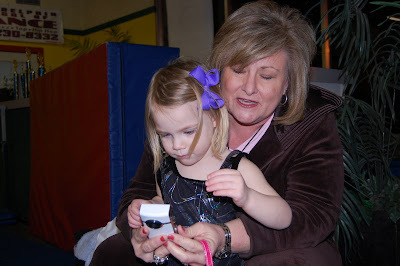 Last week Mimi and Poppa Mike came to watch her do gymnastics (or Nen-nas-tics as she calls it!) 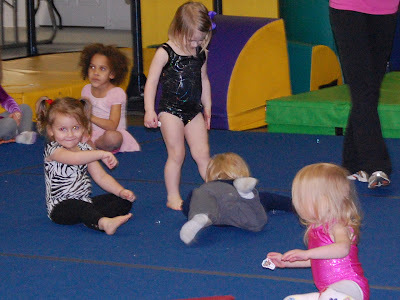 She was super excited that they came to watch her; she loves any chance to be the center of attention, ha! M.C. 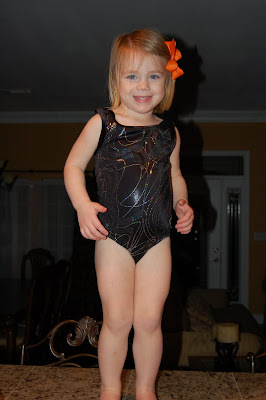 working on her straddle.....apparently we need to work on straightening those legs LOL! At the end of class they get to stomp bubbles and she loves it More bubble stomping! Mimi took lots of video of M.C. doing her nen-na-stics and M.C. had a blast watching it all. 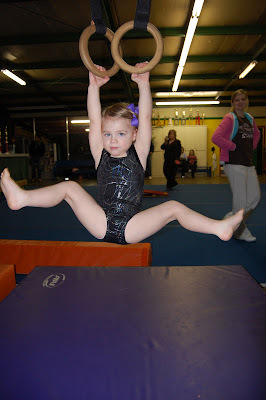 Watch out Summer Olympics 2020...... here she comes!! !